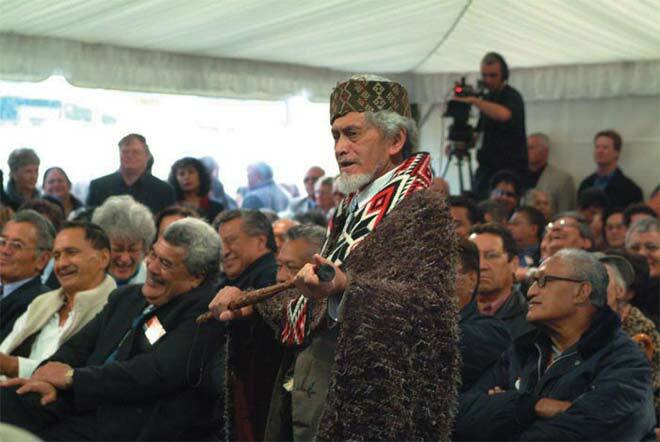 Huirangi Waikerepuru (Ngāpuhi and Taranaki) is seen here in 2004 at the opening of the Māori Television Service in Auckland. The television station was established partly as a result of a long campaign by Waikerepuru and others for the revival and official recognition of the Māori language. He was appointed to Te Kaunihera Kaumatua, Māori Television's advisory council of elders. Earlier, in 1995, Waikerepuru was awarded an honorary doctorate for achievements in tertiary education and Māori-language communities.